Finnish melancholic progressive metallers AMORPHIS released their enormously successful new album »Queen Of Time«, on May 18th, 2018 through Nuclear Blast. 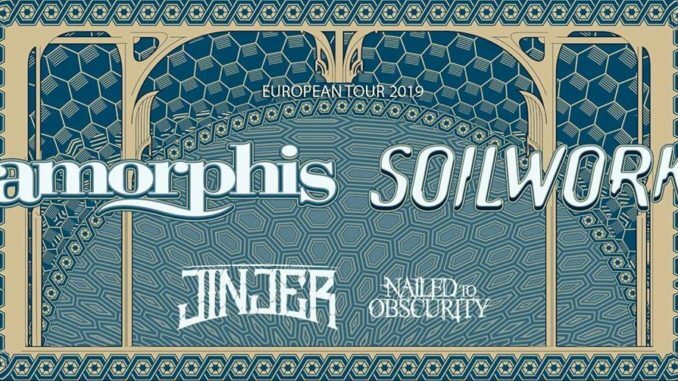 To present their new hymns live on stage, the band is pleased to announce that they will join forces with visionary Swedish metallers SOILWORK for a European co-headline run in early 2019. The band is currently working hard on the follow-up to 2015’s hit album »The Ride Majestic« (Nuclear Blast). 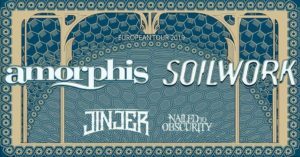 The trek will mark SOILWORK’s first tour in support of their new record. As if this package wasn’t great enough, these headliners will be supported by Ukrainian modern metal outfitJINJER plus German melodic death/doom metallers NAILED TO OBSCURITY, who are working on their Nuclear Blast debut.